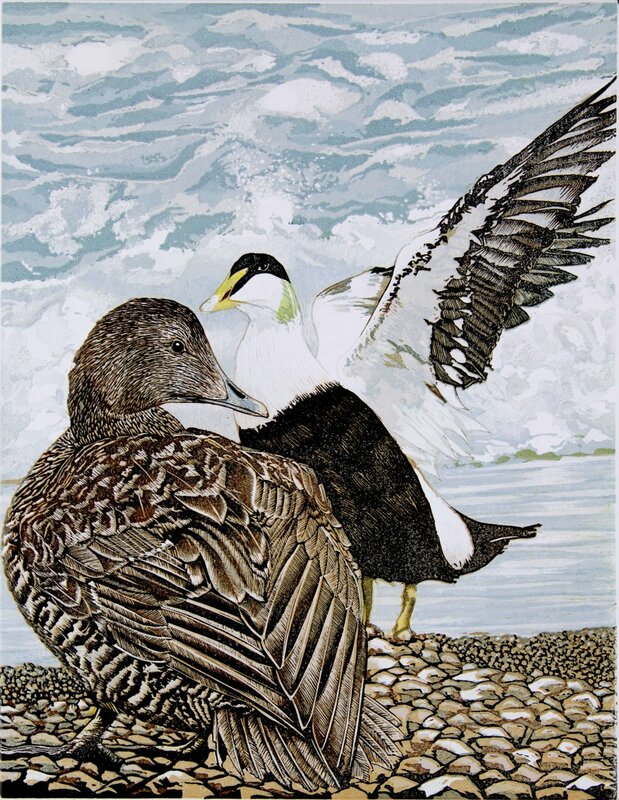 I’ve finally finished my new print ‘Eider Ducks’. Based on personal observations and photos near the Farne Islands, it measures 30 x 40cms. and is printed on Bristol Board using T.N.Lawrence oil base relief inks. It’s a reduction linoprint using thirteen different hues/tones of colour. I chose to bring the the female to the foreground for, although the male has a more dramatic plumage, I really wanted to emphasize the more subtle colouring of the female. The print is for sale and details can be found on the Sea/River Bird folder on the ‘Birds’ page. Many thanks again to Conrad Cookson who made the table top easel for me that has been a great help and to Keith Dickinson for his expert photographic help today!